The assembly government has announced a working group to ensure Anglesey and Gwynedd's economies will cope after Wylfa Nuclear Power Station closes. 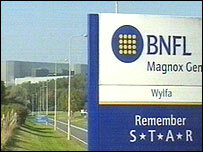 It was confirmed in July that Wylfa on Anglesey, will shut as planned in 2010. The power station, along with its main customer Anglesey Aluminium, is one of the biggest employers on the island. Economic Development Minister Andrew Davies announced a "growth hub" in the area adding that plans needed to be up and running as soon as possible. The station powers the metal smelting plant Anglesey Aluminium in Holyhead. 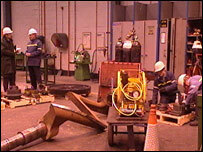 The two firms employ around 1,500 people on the island. Anglesey and Gwynedd councils have previously called on the Welsh Assembly Government to offset the power station's closure with millions of pounds worth of investment. They said a 10-year regeneration strategy, working with the University of Wales, Bangor, could to help attract businesses to the area. In a speech at the high-tech Technium CAST centre at Parc Menai on Thursday, Mr Davies announced the creation of a economic development team involving the assembly government, councils, business leaders and university academics. Consultants will look at ways of improving transport links too and from the Island and the working group, called the Mon Menai Partnership, has been tasked with coming up with other solutions. He said: "The team will develop an action plan for future economic development. "Energy supply is a key issue for the future economic development of Anglesey and retention of well-paid employment, particularly at Anglesey Aluminium. "This will be a major priority for the programme board." Speaking on BBC Radio Wales before the announcement, Mr Davies said the action plan was a "proactive" measure. He added: "With the background of the decommissioning of Wylfa and the possible knock-on effect to Anglesey Aluminium, as a government we decided we cannot wait for those events to happen. "We want to come up with a blueprint for Anglesey and north west Wales for the next 10 years. "In the past when we've been hit with major job losses we were having to react. "It's four years before Wylfa is decommissioned so we are going to be working with the public sector, local authorities, universities and the private sector to plan a blueprint and then take it forward." The Nuclear Decommissioning Authority (NDA) confirmed over the summer that Wylfa will not have its operating life extended beyond 2010. The NDA estimated it would cost up to £250m for Wylfa to continue operating beyond that date.